It specifies an unlawful blood alcohol level and says that he was released "on his own recognisance", meaning he promised in writing to co-operate with future legal proceedings. He wrote that the surgery had relieved terrible pain and that he hadn't "felt this good in years". America's 14-time major champion came back after 15 months out injured in December, but has not played since his back problems recurred in February. Plans to compete at Augusta in April - on the 20th anniversary of his first Masters win - had to be abandoned. 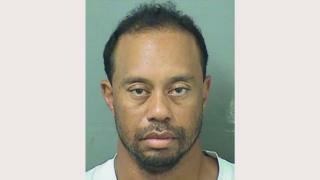 The mugshot shows a dishevelled Tiger Woods, bleary-eyed and unshaven - just the sort of image he would not want associated with himself in public. He's divorced and shares custody of his children and that's pretty much all we know of Tiger Woods' lifestyle at the moment, other than he says he wants to return to professional golf once this recovery has been completed. Does golf need him as much as it once did? Perhaps not. A whole generation of golfers, with Rory McIlroy at the vanguard, have now come through. But Woods remains a huge box-office draw. Golf has suffered in his absence in recent years but it is getting used to the fact that he's unlikely to come back right at the very top of the game. Read more: Can Woods repair damage of new low?